Any piece of software can be overwhelming at first glance, and SharePoint Designer for use with SharePoint Online is no exception. Microsoft has gone to great lengths to make the tool as intuitive and user friendly as possible — but it still helps to take a spin around the user interface. 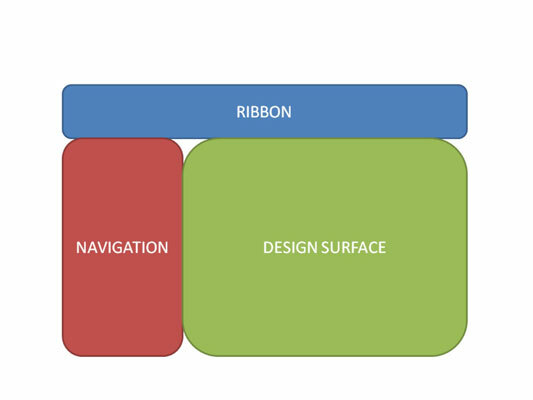 The screen is divided into three main sections: the Ribbon across the top of the screen, a navigation window on the left side of the screen, and a design surface at the right of the screen. You can use SharePoint Designer in several different ways to create a site. The easiest way is to use the SharePoint Designer File tab, also known as the Backstage View. The Backstage screen is what appears when you open SharePoint Designer for the first time; after all, you have to either create or connect to a site or Designer has nothing to work with. The base templates that are available include a blank site, a blog site, and a team site. Depending on which features you activate for a particular site collection, additional templates are available. Clicking the More Templates button enables you to connect to a site collection in order to view the range of templates you have available (based on the activated features). SharePoint Designer cannot be used to create new site collections. In order to do that, you need to use the Office 365 administrative interface.